A GREAT PLACE TO THINK! When I was a young girl I would go home to a neighbor’s house after school. She had 5 kids of her own and her middle daughter L was my best friend. Soooooo many odd years later we are still friends. That in itself is pretty amazing since we’ve know each other since we were 2 and 3 years old. Her dad worked in the grocery business and had what seemed liked odd hours to me back then since my dad worked Monday through Friday 8-5. But, that was what made her dad so awesome too! He was home on Tuesday afternoons when we got home from school and was waiting for us. He would pile us all into his car and drive us to Placerita park long before it was a nature center. We would troll around the trails and hills making a few trails of our own, play our own version of miniature golf, swing and beg him to twirl us on the merry go round for as long as his arms would hold out. 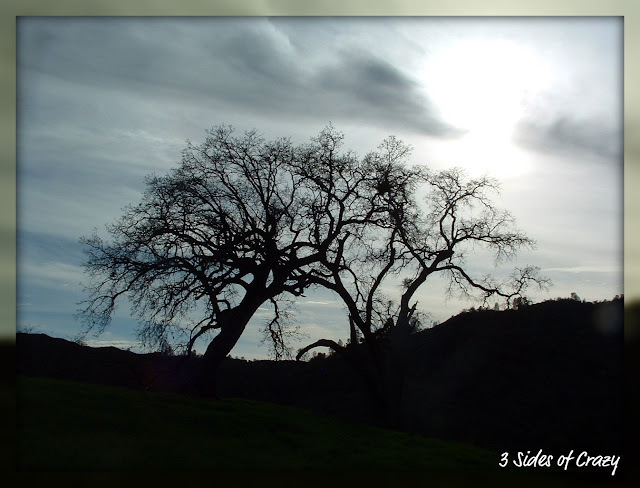 One of our favorite hikes was to the Oak of the Golden Dream, mainly because it meant hiking through a drainage tunnel back then, but later in years we realized how important this tree was to California history. We always finished the afternoon with hot dogs cooked over a bonfire on hand whittled oak sticks that her dad made while we were out exploring and then many times we would stop for a Thrifty’s ice cream cone on the way home. 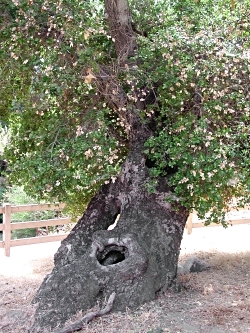 Oak of the Golden Dream in Placerita Canyon, where legend says Lopez napped and dreamed of riches. 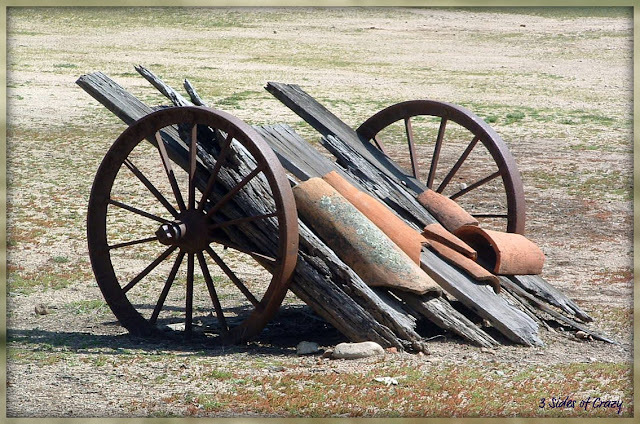 There can be no doubt that James Marshall changed the course of history when he peered into the tailrace of John Sutter’s sawmill on a brisk January day in 1848 and spied California’s future. Within weeks the United States signed peace accords with Mexico, and within a few months, Naval midshipman Edward “Ned” Beale and his pal Kit Carson were headed east with proof of Marshall’s discovery. Legions of argonauts flocked to the Sacramento Delta. Granted, few fulfilled their dreams of riches, but all contributed to the realization of James K. Polk’s visions of Manifest Destiny as they erected towns and forged a territorial economy from the glittering soil. When the news finally reached New York in September, it triggered the biggest westward migration the young nation had ever seen. The import of the occasion wasn’t lost on official Washington. Memories of the “hard times” of the 1830s all too fresh in their minds, senators hastened the admission of the “Golden State” into the Union. Within three years after Marshall’s fortuitous millwork, there were gold-producing states from sea to shining sea, and within another century, the cultural navel of the universe had shifted from Paris and Rome to a place called Hollywood. But did you know that Marshall wasn’t the first to find gold in California? And that the shiny metal had been mined there well before 1848? And that Marshall undoubtedly knew it? The year was 1842. Both Californias — Alta and Baja — were part of Mexico, and Francisco Lopez was herding cattle on his niece’s ranch in Placerita Canyon, 35 miles north of the Pueblo de Los Angeles. It was around noon on his 40th birthday, March 9. Lopez paused to rest with his two companions, Manuél Cota and Domingo Bermudez. As the story goes, Lopez fell asleep in the shade of an oak tree and dreamed he was floating on a pool of gold. He awoke, crossed the little creek to a grove of sycamore trees, stuck his knife into the ground, unearthed some wild onions — and there, clinging to the roots, were chunks of gold. “I with my sheath knife,” Lopez later recalled, “dug up some wild onions, and in the earth discovered a piece of gold, and, searching further, found some more.” That, of course, is the stuff of legend. The facts are a bit drier. But importantly to the gold history of California, they are documented. Lopez wasn’t just some lucky rancher. 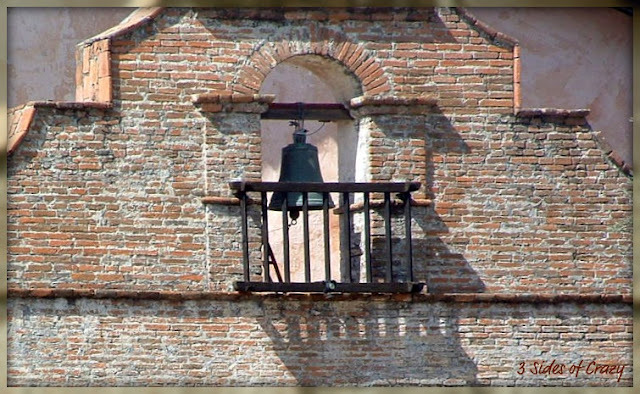 He’d been schooled in mining at the University of Mexico and had good reason to be scouring the hills above the Mission San Fernando. Cattle ranching merely paid the bills while he was on the prowl. Unverified reports of gold activity in the region date to the 1790s with the mystery of the Lost Padres mine. No doubt Lopez had heard about the party that set out from San Fernando in 1820 under the leadership of Santiago Feliciano, the onetime superintendent of government mines in Mexico. Feliciano’s party supposedly came upon a band of miners in the nearby Castaic region, not far from today’s Magic Mountain amusement park, who had panned several reales’ worth of gold. 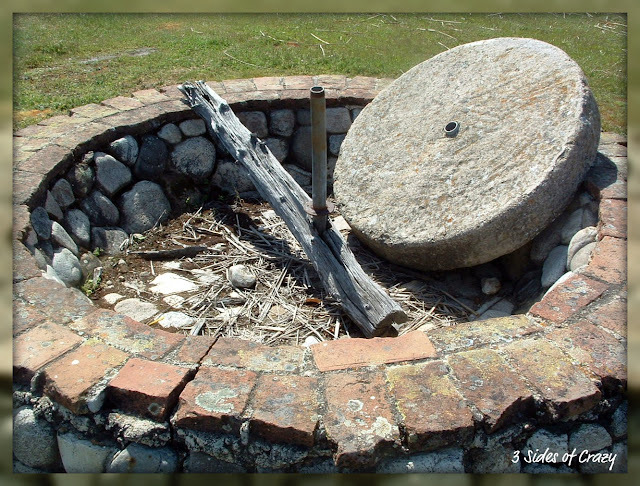 The historical literature references several similar discoveries in the vicinity after 1833. What sets Lopez’s own activities apart from earlier tales are the official records. The day after the wild onion adventure — a story Lopez himself may have embellished — Lopez and his brother, Pedro, the majordomo (foreman) at the Mission San Fernando, rode to Los Angeles to bring samples of their findings to the prominent merchant Abel Stearns. Believing the yellowish metal to be the genuine article, Stearns sent the gold via Alfred Robinson to the one-and-only United States Mint at Philadelphia, where it was assayed at .926 fine gold, worth $19 an ounce. Lopez and company quickly petitioned the Mexican governor of California, Juan Batista Alvarado, for permission to excercise what they considered their divine right to mine the metal. By “San Francisco,” Lopez refers not to the city by the bay 450 miles north, but rather to the Rancho San Francisco, as the area immediately north of the San Fernando Valley was known. Today it is called the Santa Clarita Valley and straddles northern Los Angeles and eastern Ventura counties. Del Valle was Lopez’s nephew, who died the previous year. Lopez’s original petition resides in the National Archives in Washington, D.C. It is the document that makes Lopez’s discovery the first “documented” discovery of gold in California. It follows, naturally, that Lopez’s discovery sparked the state’s first “gold rush,” albeit nothing on the scale of Marshall’s. 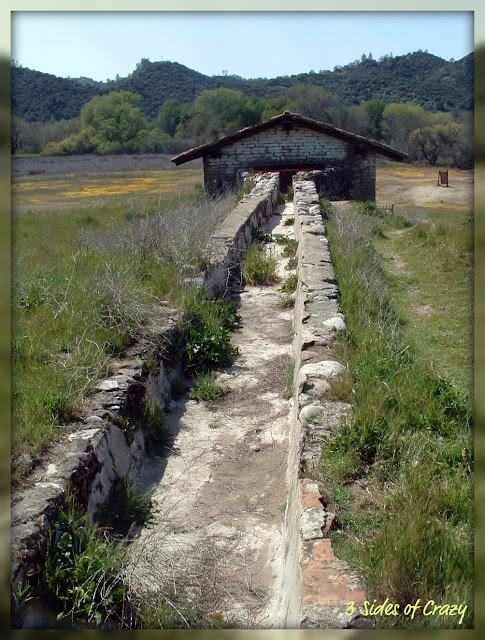 An estimated 2,000 miners, primarily from Lopez’s home state of Sonora, worked Placerita Canyon in the ensuing years. Ygnacio del Valle, Anotonio’s son, was named “encargado de justicia del placer de Rancho San Francisco” — the head of California’s first mining district. He kept meticulous records; by November 1842, two hundred ounces of gold had been extracted, and by the time the quarry was exhausted in 1848, it had yielded 125 pounds. Some of it reportedly went to Mexico where it was minted into coins. For all the Mexican silver that traded freely in the United States at the time, a little bit of “California” may have circulated the other direction in the form of escudos. That Lopez’s discovery is largely lost in the annals of U.S. history is understandable — and not only because it was so monumentally overshadowed in size and significance by Sutter’s Mill. Lopez’s discovery was a “Mexican” discovery and not an “American” one. To Lopez and his collaborators, and to most others prior to the American conquest, Placerita Canyon and the Rancho San Francisco were simply parts of Mexico. But Lopez’s doings weren’t ignored entirely by contemporary Americans. As with Marshall’s later discovery, the eastern press caught wind of it. Others took note, as well. In 1845, with war between the United States and Mexico still a year off, Alta California was ruled by the unpopular Gov. Manuel Micheltorena. His predecessor, Juan Alvarado, mounted an insurrection. Taking Micheltorena’s side was none other than John Sutter. Alvarado’s forces prevailed, driving Micheltorena back to Mexico in a one-day battle that cost no lives — but not before throwing Sutter and his right-hand man, John Bidwell, into a prison near the Mission San Fernando. They were soon released. Bidwell headed north through Placerita Canyon and observed the gold mining operations, vowing to hunt for the metal upon his return to Sutter’s Fort. When he reached his destination he would meet a new arrival — James Marshall. Do you remember Ned Beale, who carried samples of Marshall’s gold eastward in 1848? He was no stranger to Placerita Canyon. He had familiarized himself with the area during the war of 1846-48. In 1847 he accepted the sword of his battlefield adversary, Gen. Andrés Pico, at the Capitulation of Cahuenga (now Universal Studios Hollywood). Beale’s illustrious career included an appointment by Abraham Lincoln as surveyor-general of California and Nevada. Lincoln fired him when he tired of Beale’s tendency to purchase all of the land he was supposed to be surveying. Typical of the way aristocratic American and Mexican citizens let bygones be bygones in California’s early days, Beale teamed up with his old foe, Pico, in the 1860s and staked several petroleum mining claims in the Placerita Canyon area. But that’s another story. 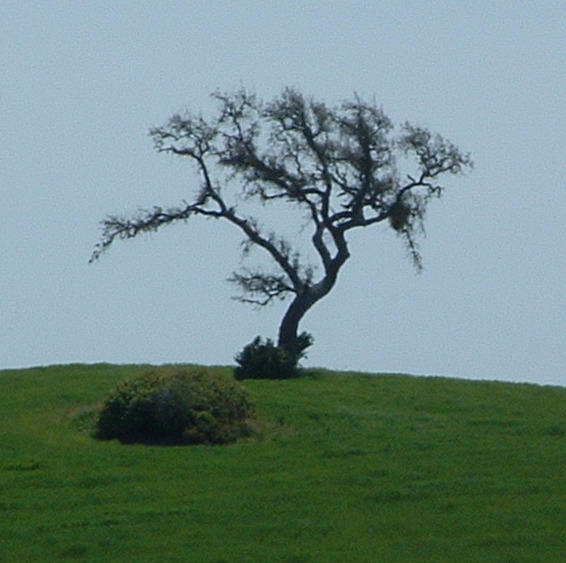 The oak is located inside Placerita Canyon State Park, operated by the county of Los Angeles and generously aided by the volunteer organization, Placerita Canyon Nature Center Associates.